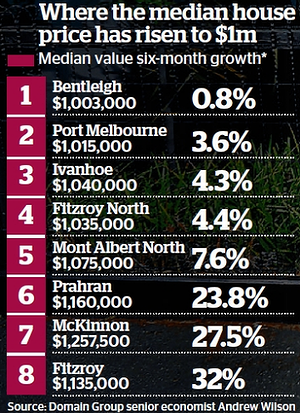 Another 8 Melbourne suburbs have now joined million-dollar club. Domain reports that these suburbs have been catapulted by years of gentrification and increased competition for property in the city’s most coveted school zones. Thirty-seven suburbs now have a seven-figure median house price – an indication that some areas continued to be in high demand as the rest of the market moderated over the second half of 2014. Domain Group’s senior economist Andrew Wilson said:. Here’s a complete list of million dollar Melbourne suburbs. Note: Only suburbs with at least 40 sales during the six months to June 2014 and six months to December 2014 period are included.